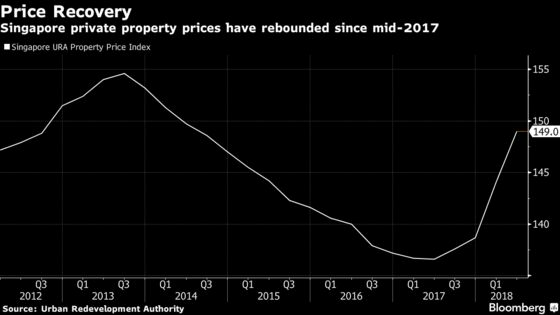 Residential property prices have rebounded since the middle of last year, after Singapore reduced a stamp duty on sellers and eased mortgage restrictions in March 2017. In the absence of the cooling measures imposed last week, prices would likely have continued higher to revisit their 2013 peaks, according to Christine Li, a senior director of research at Cushman & Wakefield. That’s now unlikely to happen, Li said. A key measures of the euphoria is Singapore’s so-called en-bloc market, where a group of owners band together to sell blocks of older apartments for redevelopment. Transactions have surged in recent months, thanks to demand from property developers. In its annual report last week, released the day before the new curbs were announced, the Monetary Authority of Singapore highlighted “strong activity” by developers in en-bloc sale tenders. Singaporeans and permanent residents have predominated in the recent rush to buy apartments, said RHB analyst Vijay Natarajan. After waiting on the sidelines while the market was in the doldrums after 2013, pent up local demand was released last year as prices started to rise, Natarajan said. The share of purchases by foreigners, a big contributor to previous prices booms, slipped to 5 percent in the second quarter, compared with 17 percent in the first quarter of 2011. 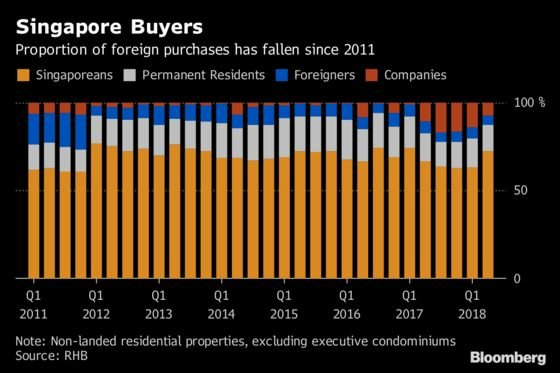 The nature of foreign buying in Singapore has changed, according to Tan Su Shan, head of wealth and consumer banking at DBS Group Holdings Ltd. 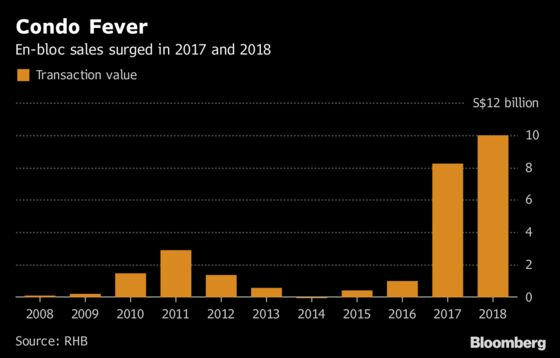 There are fewer overseas speculators buying multiple apartments, as seen in the past, compared with the "real, long-term, quality investors" which are more common today, she told Bloomberg last week.